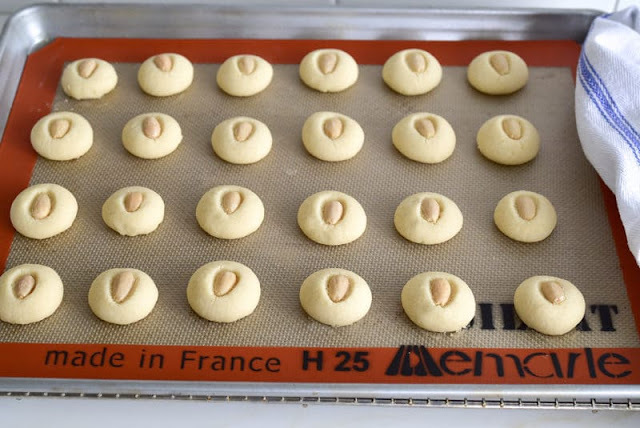 Almond graybeh is a classic Lebanese butter cookie that is delicate, light, and pure white. Almond graybeh is baked especially for Easter and Christmas. The recipe makes so many cookies (4 dozen!) that it’s perfect for weddings, graduation parties, or anytime you want lots of incredibly delicious cookies to share. Take your time shaping the little balls for these adorable, delicious cookies. Taking your rings off will help keep the balls smooth. Graybeh is meant to be snow white, yet baked, so stay on top of your oven and lift a cookie up to see how the bottom is doing as you get toward the end of the baking time. Let the cookies cool completely before touching them, as the sides will firm up as they cool. The graybeh should be small; they'll expand some during baking, so the balls will be a little smaller than seems right. But they are. Using a mixer with the whisk attachment, whip the butter on high speed until fluffy, creamy and pale, about six minutes. Stop and scrape the sides of the bowl with a spatula for even whipping. Add the sugar, orange blossom water, and vanilla and whip until well combined and fluffy. To shape the cookies, pull off a heaping teaspoon of dough and roll it between the palms of your hand into a smooth ball. Smoothness is key here to avoiding cracks in the cookies when they're baked. Form balls to fill one sheet pan with them (about an inch and a half apart; they don't need much room to expand). Press an almond into the top of each ball. Bake the cookies for about 22 minutes, or until they are baked through but only ever-so-slightly golden and still pale on the bottom. At about 18 minutes, start checking the cookies by lifting one up with a spatula. Make the remaining cookie balls while the first pan bakes. Remove the cookies from the oven and allow them to cool completely before handling them, as they will firm up as they cool. The graybeh will keep in an airtight container for a couple of days. They're better eaten soon after they're baked.